CAIRO (AP) — After torching a Franciscan school, Islamists paraded three nuns on the streets like "prisoners of war" before a Muslim woman offered them refuge. Two other women working at the school were sexually harassed and abused as they fought their way through a mob. In the four days since security forces cleared two sit-in camps by supporters of Egypt's ousted president, Islamists have attacked dozens of Coptic churches along with homes and businesses owned by the Christian minority. The campaign of intimidation appears to be a warning to Christians outside Cairo to stand down from political activism. Christians have long suffered from discrimination and violence in Muslim majority Egypt, where they make up 10 percent of the population of 90 million. Attacks increased after the Islamists rose to power in the wake of the 2011 Arab Spring uprising that drove Hosni Mubarak from power, emboldening extremists. But Christians have come further under fire since President Mohammed Morsi was ousted on July 3, sparking a wave of Islamist anger led by Morsi's Muslim Brotherhood. Nearly 40 churches have been looted and torched, while 23 others have been attacked and heavily damaged since Wednesday, when chaos erupted after Egypt's military-backed interim administration moved in to clear two camps packed with protesters calling for Morsi's reinstatement, killing scores of protesters and sparking deadly clashes nationwide. One of the world's oldest Christian communities has generally kept a low-profile, but has become more politically active since Mubarak was ousted and Christians sought to ensure fair treatment in the aftermath. Many Morsi supporters say Christians played a disproportionately large role in the days of mass rallies, with millions demanding that he step down ahead of the coup. 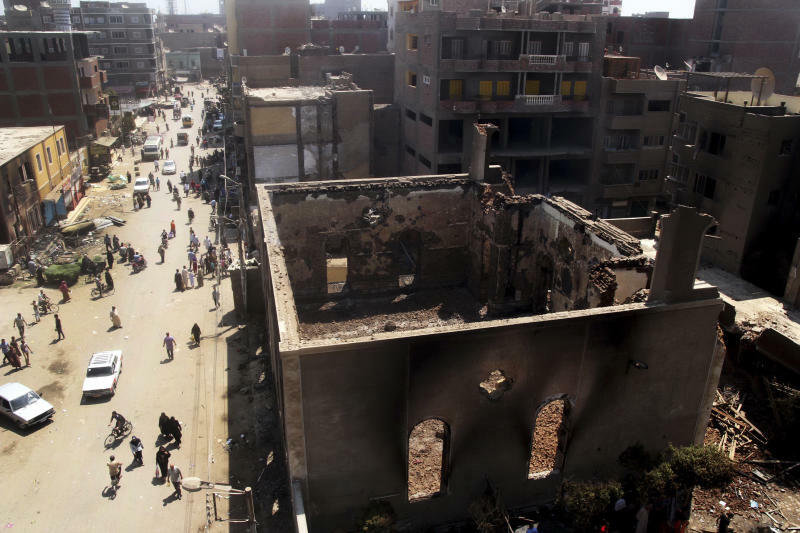 Despite the violence, Egypt's Coptic Christian church renewed its commitment to the new political order Friday, saying in a statement that it stood by the army and the police in their fight against "the armed violent groups and black terrorism." While the Christians of Egypt have endured attacks by extremists, they have drawn closer to moderate Muslims in some places, in a rare show of solidarity. Hundreds from both communities thronged two monasteries in the province of Bani Suef south of Cairo to thwart what they had expected to be imminent attacks on Saturday, local activist Girgis Waheeb said. Activists reported similar examples elsewhere in regions south of Cairo, but not enough to provide effective protection of churches and monasteries. Waheeb, other activists and victims of the latest wave of attacks blame the police as much as hard-line Islamists for what happened. The attacks, they said, coincided with assaults on police stations in provinces like Bani Suef and Minya, leaving most police pinned down to defend their stations or reinforcing others rather than rushing to the rescue of Christians under attack. Another Christian activist, Ezzat Ibrahim of Minya, a province also south of Cairo where Christians make up around 35 percent of the population, said police have melted away from seven of the region's nine districts, leaving the extremists to act with near impunity. Two Christians have been killed since Wednesday, including a taxi driver who strayed into a protest by Morsi supporters in Alexandria and another man who was shot to death by Islamists in the southern province of Sohag, according to security officials, who spoke on condition of anonymity because they weren't authorized to release the information. 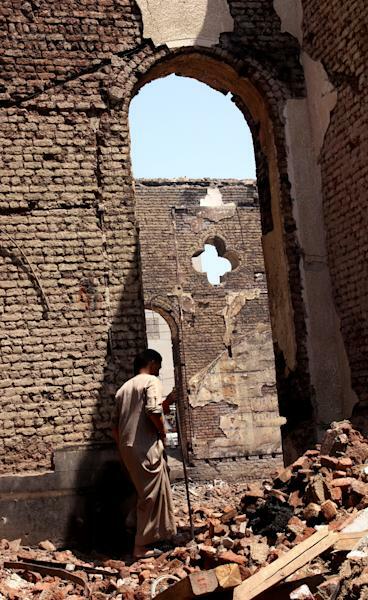 The attacks served as a reminder that Islamists, while on the defensive in Cairo, maintain influence and the ability to stage violence in provincial strongholds with a large minority of Christians. Gamaa Islamiya, the hard-line Islamist group that wields considerable influence in provinces south of Cairo, denied any link to the attacks. The Muslim Brotherhood, which has led the defiant protest against Morsi's ouster, has condemned the attacks, spokesman Mourad Ali said. Sister Manal is the principal of the Franciscan school in Bani Suef. She was having breakfast with two visiting nuns when news broke of the clearance of the two sit-in camps by police, killing hundreds. In an ordeal that lasted about six hours, she, sisters Abeer and Demiana and a handful of school employees saw a mob break into the school through the wall and windows, loot its contents, knock off the cross on the street gate and replace it with a black banner resembling the flag of al-Qaida. By the time the Islamists ordered them out, fire was raging at every corner of the 115-year-old main building and two recent additions. Money saved for a new school was gone, said Manal, and every computer, projector, desk and chair was hauled away. Frantic SOS calls to the police, including senior officers with children at the school, produced promises of quick response but no one came. The Islamists gave her just enough time to grab some clothes. In an hourlong telephone interview with The Associated Press, Manal, 47, recounted her ordeal while trapped at the school with others as the fire raged in the ground floor and a battle between police and Islamists went on out on the street. At times she was overwhelmed by the toxic fumes from the fire in the library or the whiffs of tears gas used by the police outside. Sister Manal recalled being told a week earlier by the policeman father of one pupil that her school was targeted by hard-line Islamists convinced that it was giving an inappropriate education to Muslim children. She paid no attention, comfortable in the belief that a school that had an equal number of Muslim and Christian pupils could not be targeted by Muslim extremists. She was wrong. The school has a high-profile location. It is across the road from the main railway station and adjacent to a busy bus terminal that in recent weeks attracted a large number of Islamists headed to Cairo to join the larger of two sit-in camps by Morsi's supporters. The area of the school is also in one of Bani Suef's main bastions of Islamists from Morsi's Muslim Brotherhood and ultraconservative Salafis. "We are nuns. We rely on God and the angels to protect us," she said. "At the end, they paraded us like prisoners of war and hurled abuse at us as they led us from one alley to another without telling us where they were taking us," she said. A Muslim woman who once taught at the school spotted Manal and the two other nuns as they walked past her home, attracting a crowd of curious onlookers. "I remembered her, her name is Saadiyah. She offered to take us in and said she can protect us since her son-in-law was a policeman. We accepted her offer," she said. Two Christian women employed by the school, siblings Wardah and Bedour, had to fight their way out of the mob, while groped, hit and insulted by the extremists. "I looked at that and it was very nasty," said Manal. "I am terrified and unable to focus," said Boulos Fahmy, the pastor of a Catholic church a short distance away from Manal's school. "I am expecting an attack on my church any time now," he said Saturday. Bishoy Alfons Naguib, a 33-year-old businessman from Minya, has a similarly harrowing story. His home supplies store on a main commercial street in the provincial capital, also called Minya, was torched this week and the flames consumed everything inside. "A neighbor called me and said the store was on fire. When I arrived, three extremists with knifes approached me menacingly when they realized I was the owner," recounted Naguib. His father and brother pleaded with the men to spare him. Luckily, he said, someone shouted that a Christian boy was filming the proceedings using his cell phone, so the crowd rushed toward the boy shouting "Nusrani, Nusrani," the Quranic word for Christians which has become a derogatory way of referring to them in today's Egypt. Naguib ran up a nearby building where he has an apartment and locked himself in. After waiting there for a while, he left the apartment, ran up to the roof and jumped to the next door building, then exited at a safe distance from the crowd. "On our Mustafa Fahmy street, the Islamists had earlier painted a red X on Muslim stores and a black X on Christian stores," he said. "You can be sure that the ones with a red X are intact." 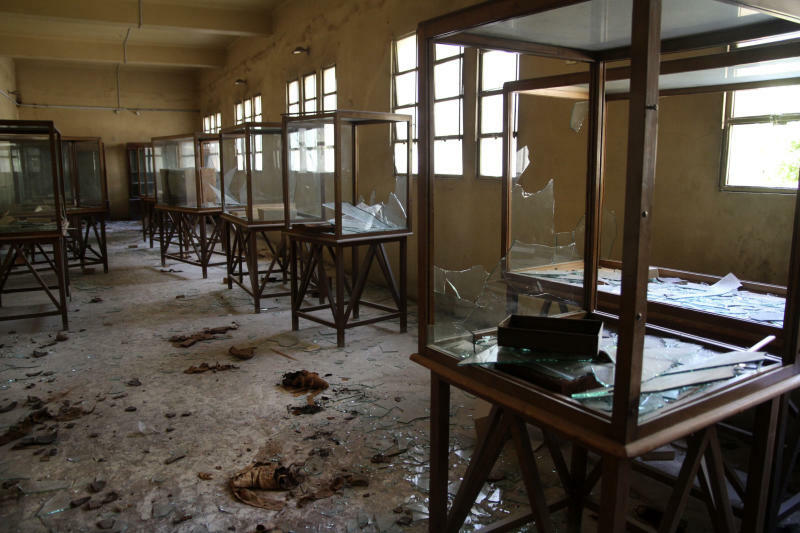 In Fayoum, an oasis province southwest of Cairo, Islamists looted and torched five churches, according to Bishop Ibram, the local head of the Coptic Orthodox church, by far the largest of Egypt's Christian denominations. He said he had instructed Christians and clerics alike not to try to resist the mobs of Islamists, fearing any loss of life. "The looters were so diligent that they came back to one of the five churches they had ransacked to see if they can get more," he told the AP. "They were loading our chairs and benches on trucks and when they had no space for more, they destroyed them."